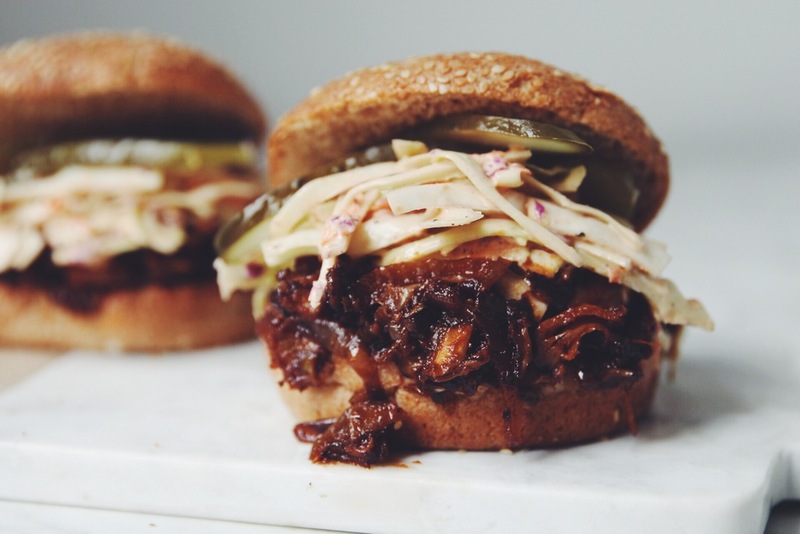 There’s many ways to mimic the meatiness of a bbq pulled pork sandwich. I’ve made a TVP version as well as a jackfruit version which you can find in the hot for food cookbook. I even have an all mushroom version I RECIPE? !’d, but this is an uber easy method using mushrooms again and incorporating even more texture from marinated artichokes! These are common ingredients everyone has access to and the recipe has you creating a saucy sandwich filling right in one pan! 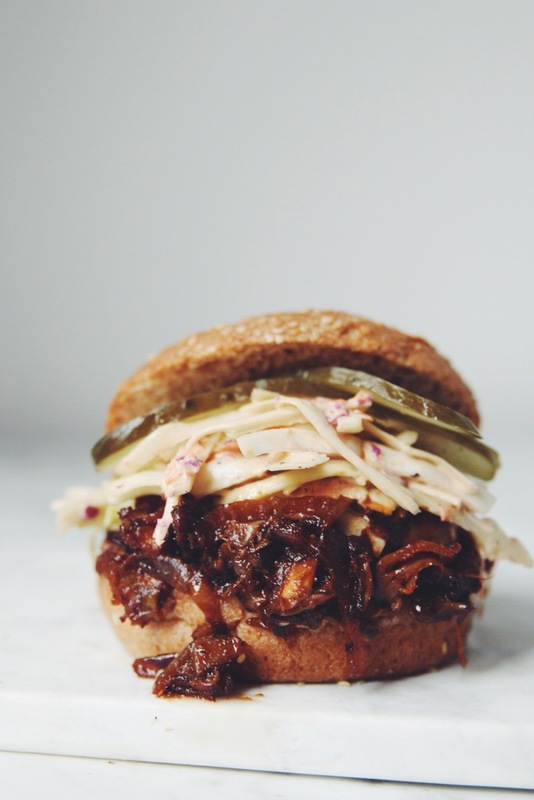 Combined with a quick slaw it’s got all the things you want in a stacked sandwich; it’s meaty, saucy, crunchy, sweet and sour! I actually created this for Vegan It! on Chatelaine’s YouTube channel and you can watch it below. you can go meatless no problem with this easy vegan pulled pork sandwich made with a sauced up bbq combo of mushrooms and artichokes! Heat a large pan over medium high heat with vegetable oil. Once hot add the sliced onions and sauté for 5 minutes until softened and slightly browned. Add mushrooms and minced garlic and cook for another 3 to 4 minutes until most of the water from the mushrooms has evaporated. Add the roughly chopped artichokes and cook for 5 to 6 minutes, stirring occasionally. Add smoked paprika, ground mustard, sea salt, ground pepper, tomato paste, soy sauce, brown sugar, and apple cider vinegar and stir to combine well. Spread out the mixture into an even layer in the pan and cook for 15 more minutes only stirring once or twice. You’re trying to caramelize the mixture a little bit so don’t stir it too much. It will reduce and get much darker in colour. Serve immediately on lightly toasted buns. Top with slaw and pickle slices! This dish was absolutely delicious. I was skeptical because I don’t like mushrooms – really none at all – but this was a touch down (I made them super bowl Sunday) 🙂 My husband approved too. The coleslaw added a good touch too – YUUUMMM. Really loved this recipe! The sauce is especially delicious and I loved the hint to avoid stirring too much so that the filling gets browned. I think I’ll use non-marinated artichokes next time so that the final product isn’t so oily. Absolutely LOVED this! All the spices are spot on. I can’t believe I made this myself and didn’t get it at a restaurant! Will definitely be making again. Might try to sneak in a few lentils for an extra pack of protein! This sounds good but what would you use in place of the brown sugar? I don’t use sugar in any form in anything if I can help it.